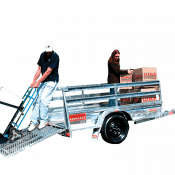 A tradesman quality, general purpose trailer with high sides that tows behind any vehicle. Our 'Safe Towing Guide' is supplied with every hire. We also sell tow balls and ropes, hire tarpaulins and load covers and have a wide range of moving accessories. Click here to determine the towing capacity of your vehicle? - Kennards hire will assist in connecting the trailer to the hirers/drivers vehicle but it remains the responsibility of the hirer/driver to ensure trailer is correctly fitted to the tow vehicle before leaving hire depot and throughout period of hire.